A large-crowned tree with a straight trunk, usually about 25 to 30 metres tall, but sometimes reaching a height of 50 metres and a diameter of 2 metres. Needles occur in bunches of three (occasionally both twos and threes), 12 to 28 centimetres long, slender, with sharp points and sharply toothed edges. Seed cones are narrowly oval when closed, 7 to 14 centimetres long, with no stalk. The scales get thicker towards the tip and have a sharp, rigid prickle. Seeds have a 2.5 centimetre wing. Blackish, rough, and scaly on young trees; on mature trees the bark is very thick (up to 10 centimetres), bright orangey-brown, and deeply grooved into flat, flaky plates. It is the characteristic tree of the southern Interior. 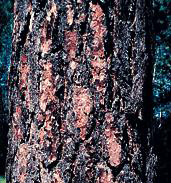 Ponderosa pine occurs on a variety of soils, from extremely dry to well-drained, relatively deep, moist soils. It grows in pure, open, park-like groups at lower elevations. At higher elevations it grows with Interior Douglas-fir. 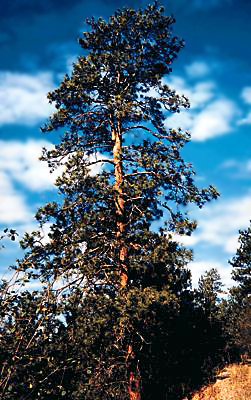 Ponderosa pine has a long, deep root that enables it to access the deeper, moister soil. The long root also makes it quite wind-firm. These trees can live as long as 400 to 500 years. Fires are common in ponderosa pine forests and the thick bark protects the trees from the frequent ground fires that lightly burn fallen needles and dead grass. It is common to see fire scars on older trees. Aboriginal people in the Interior of British Columbia had many uses for ponderosa pine. They ate the seeds and inner bark of both the ponderosa and the whitebark pine. Some Interior groups used the wood for making dugout canoes. They used the pitch for waterproofing moccasins and other items. They also mixed it with bear grease and used it as an ointment for sores and inflamed eyes. The wood is used mainly for doors, windows, and furniture, as well as paneling and shelving. For many, the name ponderosa conjures up romantic images of the wide-open spaces of the untamed West. However, David Douglas named the tree because of its ponderous size. The other common name, yellow pine, refers to the clear, even-grained wood that is found in very old, large trees. On a hot day, the bark of the ponderosa pine smells like vanilla and when you break a young twig it smells somewhat like oranges.